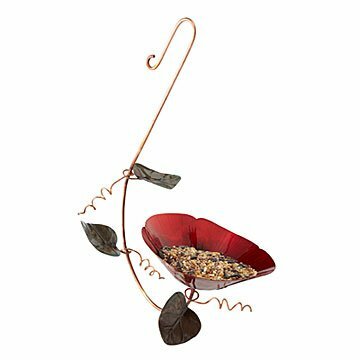 With its vibrant floral focal point, this feeder invites hungry feathered friends to perch and dine in. See you in the back yard for bird seed—just look for the one wearing a red flower. With its vibrant floral focal point, Catherine Murphy's feeder invites hungry feathered friends to perch and dine in. The copper design is strong enough to support heavier birds, and it's protected by a clear finish for year-round outdoor use. This avian oasis will add handcrafted appeal to your porch or garden. Handmade in Asheville, North Carolina. Sent in a timely manner. Recipient said it is gorgeous. My mother raved about the bird feeder.